Can I Train Through an Injury? A concern when faced with injury is how to maintain a reasonable training load without losing fitness and furthering the breakdown of tissue. It’s all too easy to teeter along the fine line of loading the body to yield a positive stimulus and reaching the point of diminishing returns. Let’s take a dive into what happens when we overload our bodies and how to assure success in 2018. The photo above shows that as a load increases, the tissue length also increases. Once past the elastic region, the tissue length has officially changed. This can result in both positive and negative adaptations. Chronically overloading tissue will result in breakdown and injury. 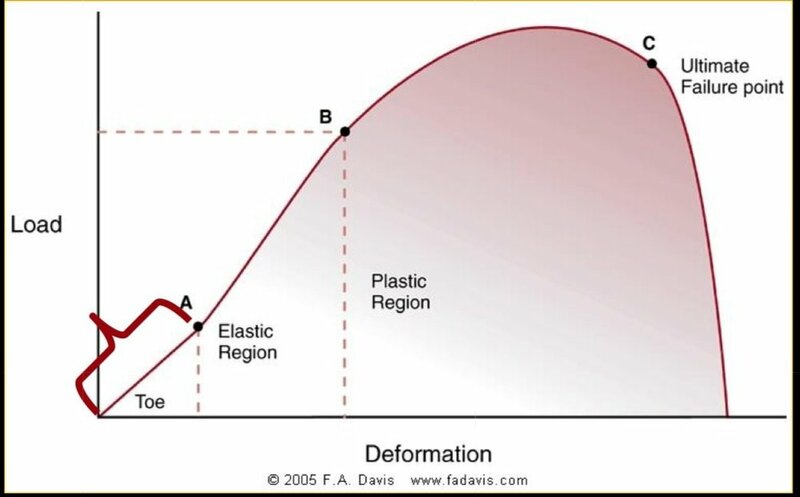 Training loads that float around the elastic region and infrequently into the plastic regions typically result in positive adaptations. When loading into and above the plastic region both acute and chronic injuries occur. Let’s take a real life example of a runner with a hamstring strain. A strain is a complete or partial tear of a muscle. First we must examine what rest:activity ratio is appropriate to allow the runner to heal. Maybe the runner can maintain 50% of their current training load. Possibly full volume can be achieved though speed work should be eliminated. Or maybe he/she is a candidate for complete rest. Obviously this criteria is determined on an individual basis. So what can we do while injured to promote healing, sustain fitness, and prevent reinjury from occurring? · Determine the appropriate dosage of training. This is something a health professional or physical therapist can help you with. Of course, I do not prescribe complete rest to all of my athletes and determine what training load can be maintained through an injury. Working with a professional is vital in determining an appropriate full return to sport. · Cross-training. Due to the Specificity of Training principle, it’s clear to us that the best way to get better at running is to run. However, when this is inhibited due to injury it’s important to note that research supports central adaptations (sharpness in the neuromuscular system, circulation, oxygenation of tissues) in the body are maintained and even improved with cross training. It is our peripheral adaptations that are best trained with running. · Eccentrics. Anyone in the physical therapy profession is familiar with Wolf’s Law which states that the body improves when faced with tensile forces in the line of stress of the tissue. Simply put, this means we need to appropriately load the tissue that will promote healthy realignment to increase function and reduce pain. Research even supports including eccentric training in the endurance athlete’s weight training program to prevent the chance of sustaining a strained muscle. · Determine an appropriate return to sport. This is when your physical therapist is most important to prevent reinjury. Some simple tips include: 1. Pain should not increase during or following the activity. 2. Your running gait should be normalized and no limp is present. 3. Avoid training greater than 50% of weekly volume on the weekend. In conclusion, ideal recovery is vital in optimal recovery and repair from an injury. Complete rest is rarely prescribed in the return to sport process as some adaptations will be needed to promote healing. Be sure that your established training plan is not one that overloads the tissues to the point of no return.